Pleasant surprises motivate – Office Vibe is set up a little like a game, with cute cartoons and icons to click. That helps make the quick 5 questions it asks each week feel easy and fun to answer. My favourite feature though is the one that lets you give a quick piece of feedback to a colleague – you can type in a way that they help you do your work and they receive an email with your feedback. Receiving a brief email that lets me know someone appreciated when I was proactive about a project, or helped organize important meetings, is a nice pick-me-up during the day. That it’s unexpected and unsolicited makes it feel, to me at least, genuine and heartfelt. Balance objective and subjective – The most helpful feedback tool I’ve ever come across is also the most simple: “When you……I feel…….” The idea is that you fill in the first blank with an objective action – when you asked me how my weekend was. When you reschedule meetings the day of. When you delivered the report I asked you for early. And then you fill in the second blank with the effect you feel that action had on you – I felt supported. I have a harder time organizing my schedule. I felt I could trust you with important work. This simple construction means you’re speaking to the only two things you can know with any certainty – observable actions and the way they made you personally feel. I find this helps keep feedback in the constructive realm, even when it’s on a difficult topic. Rigor wins – Office Vibe comes with a dashboard that helps us see trends in the feedback our team is giving. The trick is to be rigorous about using it! In months where we’ve been rigorous about discussing the dashboard as a team and leaving time for the exchange of feedback in person we’ve been able to make adjustments based on the feedback we’ve given. Sometimes we feel too busy to make the time for those conversations – but are trying to make it into a rigorous habit. Feedback is a practice that takes repetition and dedication. We haven’t figured everything out when it comes to our internal feedback culture. But so far we’re doing a good job of using the Office Vibe tool every week, which is a good sign that our habits are changing. And the trends in the feedback have helped us realize we need to focus more on our team’s wellness – how often we take breaks, exercise, eat lunch away from our desks, etc. 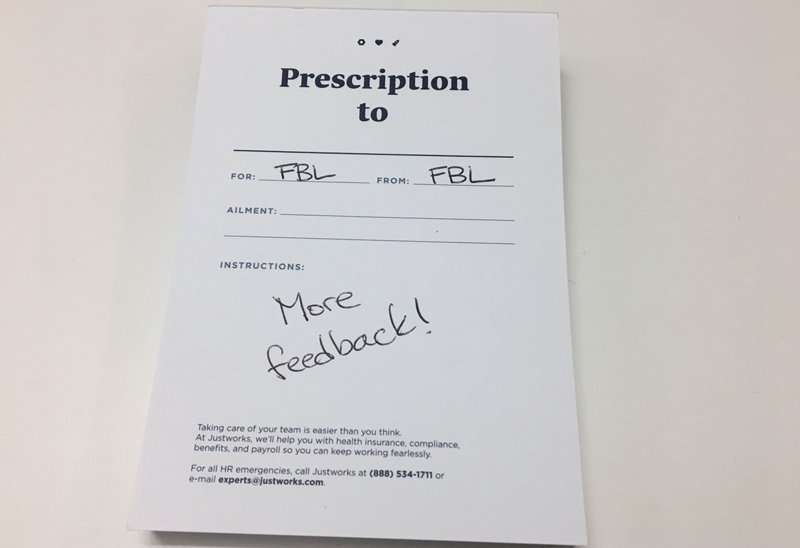 The next few months will tell us a lot about how our feedback practice is evolving. And in the meantime, we’d love to hear what practices you’re using! As Senior Manager of Research and Learning Megan helps to set the learning objects and agenda for Feedback Labs by helping determine the right questions to ask, and how we should ask them. She manages the blog and other writing, and leads research and experimentation.